Sydney Aiello, 19, killed herself Sunday, friends of the former Parkland student told NBC 6. A survivor of the mass shooting at Marjory Stoneman Douglas High School died by suicide this past weekend. 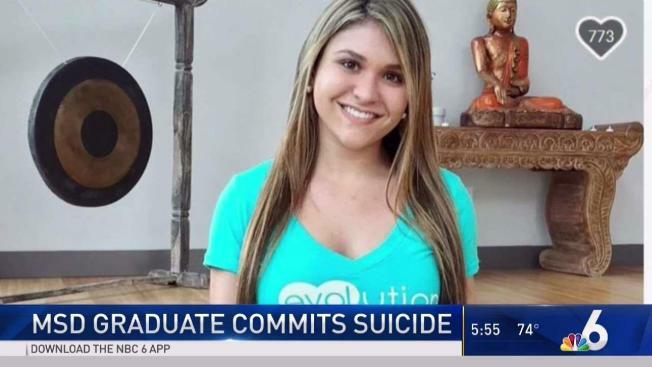 Sydney Aiello, 19, killed herself Sunday, friends of the former Parkland student told NBC 6. Family and friends were saying their goodbyes to Aiello at a funeral on Friday. Andrew Pollack, whose daughter, Meadow, was killed in the Feb. 14, 2018 shooting, told NBC 6 his daughter had been friends with Aiello. Pollack said he was too distraught to speak Friday. "Beautiful Sydney with such a bright future was taken from us way too soon. My friend’s sister and someone dear to Meadow," Pollack's son, Hunter, tweeted. Ryan Petty, whose daughter Alaina also died in the school attack, started the Walkup Foundation to raise awareness of mental health issues both to prevent mass shootings and to help those suffering after they occur. "It’s devastating, it was hard enough to lose the 17 and to think that more people are suffering to the point where they feel like they need to take their own life, it’s heartbreaking," Petty said. A GoFundMe set up for Aiello's family had already surpassed its $20,000 goal in one day.